Silver Gothic Engagement Ring : LOVE2HAVE in the UK! This designer for Love2Have has come up with something beautiful here with this fabulous handmade sterling silver Gothic engagement ring. 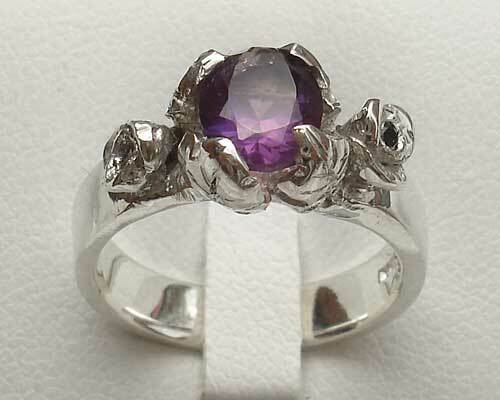 The purple amethyst is the centrepiece and oval-shaped, and we measure it at about 8mm across. It is set very securely with a silver clasp type arrangement of four silver leaf style designs that cup the stone. Additionally set either side of this setting are a further two black diamonds, one on either side and each measuring 1.25mm. Each silver part resembles a flower or tiny petals. 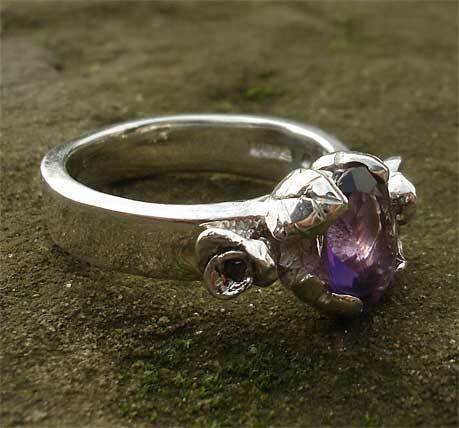 The combination of the black, purple and silver give this unique engagement ring an unusual Gothic appearance, and with the silver band itself measuring 4mm wide approximately, the ring sits nicely on the finger. Subtle enough for an engagement ring and bold enough to never be forgotten. Precious stone(s) Available: 1 x 8mm purple amethyst and 2 x 1.25mm black diamonds.